In 2014, Can travelled to the US for the third time to meet up with some of his American BJJ friends. 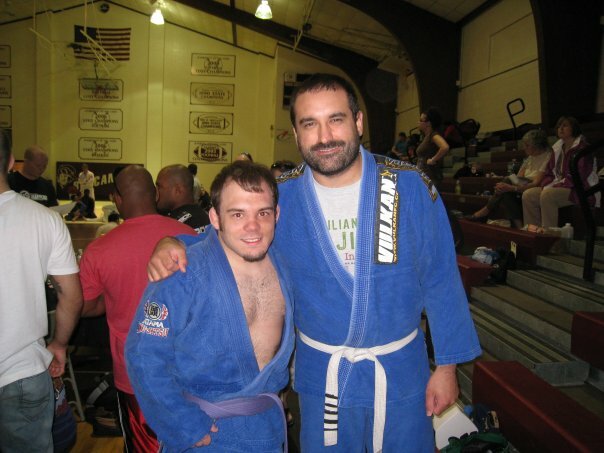 He started in Virginia, a place that has an incredible BJJ community. At the heart of that are Chrissy and Brian Linzy, who together with Andrew Smith co-founded US Grappling. In this first section of a five part interview, Chrissy and Brian talk about how they got into Brazilian jiu jitsu. The second part will be up next week, while the third and fourth parts can be found on the Martial Arts Illustrated website, here. CAN: How did you get into jiu jitsu? CHRISSY LINZY: I guess Brian got into it first, so you should start, then I’ll say what I did. BRIAN LINZY: We lived in Colorado, then I took a job in Richmond, Virginia. I moved here to Virginia Beach and lived in a hotel for a few months, ahead of Chrissy while she was closing up our business in Colorado. My new job at AT&T mostly involved the management of AT&T hiding us in a room with no windows and pretending we weren’t there, because they were trying to work out what to do with all the non-union people that they had just hired. They felt that putting us on the floor with the union people would have been like throwing us to the lions, which it actually was. They were right. Klint said, “Yeah, but you’ll probably find that’s enough.” So I went Tuesday and Thursday, then Tuesday, Wednesday and Thursday…Friday…oh wow. [laughs] I was pretty much instantly hooked. CAN: It wasn’t a matter of seeing the UFC, those usual reasons for starting at that time? BRIAN LINZY: This was in 2005. By chance, in 1993 when the first UFC happened, I was living with my parents because I was in high school. My brother did come home that weekend and bought the UFC and I watched it with him, so we saw Royce go through everybody. Then I never thought about jiu jitsu again until 2005. CAN: So when Klint mentioned it, you were aware of what jiu jitsu was? BRIAN LINZY: Yeah, I connected it with “the thing that Royce did a long time ago.” I had for years before that had it in my head to do some kind of martial art. From going around to different schools wherever we lived, I had decided that kung fu was probably going to be the thing to do. I just never pulled the trigger on it. Then jiu jitsu just kind of appeared in front of me. That was it, I never looked back. I still did a little bit of muay thai, but only one day a week for another three or four months. It was pretty much all jiu jitsu after that. Just like Brian, I went every day that there was class for a long time, probably until one of us got injured or I had to travel for work. BRIAN LINZY: It was real awkward for a while, when Chrissy first started training. If I was just standing there at the edge of the mats, when some guy would go with Chrissy and shake hands, they’d wait and look past her at me, until they made eye contact. Then I’d have to give them the nod. CHRISSY LINZY: Yeah, nobody ever asked me to train. I had to go get my own training partner every day. I was kind of oblivious: I had no idea Brian was basically approving or declining my partners. CAN: Was that just because you were her husband, or because you’re a big guy? BRIAN LINZY: I guess a little bit of both.